No single play in FSU football history has ever eclipsed "The Catch." If you're an older Nole, this image is forever etched in your brain. If you're younger than 30, take a good look at it and the other photos in this piece (including the SEC referee signaling incomplete). You'll soon feel the outrage that they never fail to ignite among Seminole faithful. The best account of that dark day appeared in The Tallahassee Democrat on the 20th anniversary of "The Catch." We re-print that story here, with permission from The Democrat. Special thanks to author Gerald Ensley for making it possible. The amazing thing is that it was Lane Fenner's only play of the game. Or maybe it's amazing that Ron Sellers was on the bench. Or that it was the same play Florida State had just run. No, the amazing thing is that 20 years after it happened, the truth is still elusive. "I was in bounds. It's that simple. It was a touchdown," said Fenner. "I made the right call. He did not have possession of the ball before he went out of bounds. The films prove it," said Doug Moseley. Of course, the truth is immaterial now. What is important is the legend. It is a legend known simply as the Lane Fenner Catch. 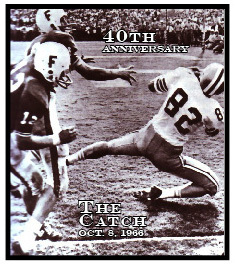 And it is simply the most famous catch — or non-catch — in the history of the Florida-Florida State football series. Some night argue that it is the most famous play in the series. "It's established itself as a classic that lives on. It's something people always talk about," said Ray Graves (U. of Florida Coach that day). The legend was created on Oct. 8, 1966. Fenner, Moseley, Gary Pajcic, Bobby Downs and Larry Rentz were the principals. Graves, Bill Peterson, the remainder of two teams and more than 40,000 fans were the witnesses. The occasion was the ninth Florida-FSU game, though only the second in FSU's Campbell Stadium. Florida led the series 6-1-1. Florida led the game 22-19 with 17 seconds to play. FSU had the ball on the Florida 45-yard line. "The play was full-right, 82, Z-up — one of my favorite calls, said Pajcic, now a lawyer in Jacksonville. "The tight end does a 10-yard out. The split end drags the middle. The flanker does a post, although in this case, I told Lane to turn it up, rather than post." Injured before the season, Fenner was playing his first game of the season in the team's third game. "I hadn't even attended the first two games of the season," said Fenner. "It was my first play of the season." Fenner was on in place of star wide receiver Ron Sellers who was on the sideline after having the wind knocked out of him on the preceding play: also a full-right, 82, Z-up, which had been incomplete. "I had played the whole game. It was the only play Lane had," said Sellers, who was the game's leading receiver with nine catches for 117 yards. Tall, at 6-foot-5, and fast, the well-rested Fenner raced past defensive backs Downs and Rentz. Pajcic rolled right, and passed deep. "Fenner was fresh. I wasn't," recalled Downs, the primary defender. "Larry came over to help." Rentz almost got to Fenner in time. "I actually touched the ball with the tips of my fingers," said Rentz, the free safety, who leaped alongside Fenner in the end zone. Downs and Rentz agree on only one thing after that. "Fenner made a great catch," said both. A roar went up from the crowd. "I remember it like it was yesterday," said Sellers, who was prone on the bench while trainers worked on him. "I said 'Lord, please let it be a touchdown." Most spectators thought it was. Until they saw Moseley, the field judge. Following the play from the line of scrimmage, Moseley arrived at the end zone and signaled incomplete pass, indicating that Fenner was out of bounds when he landed with the catch. "Lane, who rarely showed emotion on the field, was screaming and cursing," remembered Pajcic. "You know I was in, tell him," said Fenner. "Rentz just walked away." FSU attempted another deep pass to T.K. Wetherell. which was incomplete. Then Pajcic hit Billy Cox with a 13-yard pass that Cox ran out of bounds with three seconds to play. On came Pete Roberts, whose 48-yard field goal missed. Florida won. The next day there were pictures. For years, there were pictures. "I saw one in the Capitol the other day," said Graves, the Florida head coach in 1966, now an executive working for George Steinbrenner. The still pictures always have suggested that Fenner made the catch and was in bounds. "But I saw films, both FSU's and Florida's. I looked at them frame by frame. And there is one frame that showed definite daylight between the ball and Fenner's hands as he's touching out of bounds," said Moseley. "I have never reconsidered because I know I made the right call." "I was mad enough that I showed those pictures everywhere, and told the players that we had won," said Peterson, the FSU head coach in 1966, and now an FSU money-raiser. "Some of that was psychology for my players. I wanted them to know that they had won. But I always believed Fenner caught the ball in bounds and rolled out of bounds." For instance, Downs once told Sellers that he thought Fenner was in bounds. And when Rentz and Fenner were together at camp with the San Diego Changers, "he admitted I was in," said Fenner. Today, neither defensive back is sure. "It's hard to say if he was in or out. Larry and I were in the air thrashing around trying to knock the ball away," said Downs, now a real estate agent in Winter Haven. "If pressed, I'd say he was out of bounds", said Rentz, who works for a commercial real estate firm in Miami. "I do recall saying something to Lane at San Diego. But it was just in jest." Some said Moseley was not in position to make the call. "I outran the referee. He was tired," said Fenner. "I was in shape then," said Moseley, an executive with a petroleum company in Tampa. Regardless, it is a play that never dies in the minds of FSU supporters. Which amuses some of the principals, who are forever reminded of their role in the incident. "I get comments every year," said Moseley, who quit refereeing nine years ago after 20 years as a Southeastern Conference official. "I'm sure FSU had several controversial calls since 1966. It amuses me that people still bring this one up 20 years later," he said. But that is the way of legends. And in the way of all legends, there will never be a final word. Just impressions. "My impression was that maybe we got a break that day," said Graves. Why isn't the film footage available to review it today? It's more than plausible to settle the question using all the film footage, from all the angles available (like the ref said he viewed in the article) should settle the question rather than just two STILL photographs. The name Doug Mosley will allways live in imfamy in Tallahassee... but maybe some twisted justice? Skip forward 8 years... the Gators are locked in a Sugar Bowl battle with Nebraska... UF running back Tony Green scored an apparent TD... but was called out of bounds around the 10-yard line by the ref. Replay showed Green did not, and the TD should have been counted. The Gators failed to score and utimately lost 13-10. The ref who blew the call and cost UF the game: Doug Mosley!